Hi everyone! We have a tasty new treat to tell you about today. *We received Friskies Lil’ Soups with Sockeye Salmon in a Velvety Chicken Broth Lickable Cat Treats for free in exchange for a fair review. All opinions are our own. Friskies Lil’ Soups with Sockeye Salmon in a Velvety Chicken Broth Lickable Cat Treats come in a case of 8. Joanie got first dibs being that she was going to have her dental the next day. She loved her soup. Penny loved it too. And so did Millie. I used up the rest on Tallulah and Emmy who both need the added calories. These are especially good for cats that need more moisture in their diet as well as picky older cats needing to gain some weight. I plan to order some because Tallulah is just under 5 pounds, she is slowly gaining, but will definitely benefit from these. They are a little pricey at $7.50 for 8 ( 1.2 ounce cups), but well worth it. To order some click here. They come in 3 other flavors too. And be sure to stock up on all your cats’ supplies while there because Chewy has free shipping on orders over $49. All orders arrive in 1-2 days, mine usually arrive in less than 24 hours. We are joining The Chewy Blog Hop. 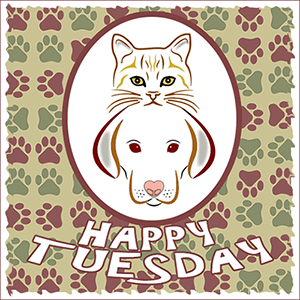 And the Comedy Plus’ Happy Tuesday Blog Hop. This entry was posted in Blog Hops, Chewy Reviews and tagged #ChewyInfluencer, Comedy Plus Happy Tuesday Blog Hop, Friskies Lil' Soups with Sockeye Salmon in a Velvety Chicken Broth Lickable Cat Treats, Joanie, Milie, Penny by pilch92. Bookmark the permalink. Those flavors *sound* really good, but I dunno. I have never been very good at soupy or gravy-ish things. I’m a pate boy from way back. But I might ask the Human nicely to get me one can and see what happens. Seems like she could do *that*, right? She owes me after that unprofitable excursion to PetSmart. Fooey! Yummarino! I might even eat those even though I’m a dry food dood! That is just what we need for some of the cats around here. We will have to give it a try. Thanks for the great review. Have a good day. Interesting! I’m happy to say both our geriatric cats are maintaining a good weight but I’ll keep this in mind if anything changes. Be well! If the kitties love them then it’s worth it. I always got what my kitties liked and I know they appreciated that. We bet we would LOVE those, but out mom sticks to feeding us pate. She knows that anything with gravy means we lap that up and leave the meat. But, she might be convinced to get some as a treat for the skinny boy Elliott. I hope he gets some. Has he had his thyroid tested? Chris needs to have teeth pulled. Maybe this would be good for him for a while. It would be good for him. I am praying all goes well. Getting liquid in a kitty is always a good thing. I never could get Z to eat wet food. She would lick the gravy/sauce/juice off but no go on the wet food. I am glad it will help Tallulah and Emmy! Great review! We received this item too and will be reviewing it later in the week. Cookie didn’t give anyone else a chance to try it. She loved it. Wow, your kitties are so fortunate to get such yummy goodies! Nice review and recommendation. Those do sound really good, we may have to give them a go! Your kitties will love them. Looks like it was quite popular! I hope it will help Tallulah gain some weight! Am always wanting to feed Angel more, since she’s our older kitty. The Hubby says, “NO!”, believing that she is purrfect. But, I say, she’s a bit boney! Have you had her thyroid tested? That can cause weight loss. These look tasty. Maybe I can get mom to get some of these for me. Hubby and I love soup!! Chewy always finds great choices for us to taste test. We bet that soup is very tasty. Soup sounds like something Samantha would like! Looks like everyone was very happy with this new product. The soup sounds wonderful for the senior kitties around here. Thanks for sharing your pawsome review. Have fun and enjoy your delicious soup. We have one who needs to gain weight, this sounds like a good choice! Did you get your cat’s thyroid checked? That can make them thin. Wow, soup for cats sounds like a good winter meal – thanks for the review! Meowza! I read your review and drooled all over the keyboard and made The Female Human mad! We’ve personally vetted the tuna flavor … and it’s all that and a bag of chips! I think that would be a hit here too. Sounds like the food was a hit! I’ve never heard of these. They sound really interesting. I’ll have to check and see if we have that Friskies selection here. They are new, I hope you can get them too. Thanks for the info, my cousin’s kitty is getting old and losing weight, maybe this could help him. I hope it helps. Your cousin needs to get the cat’s thyroid checked, it is common in older cats and easily fixed with daily pills. I’m glad you did this review! I just recently heard about this and was wondering about it. The two here do not need to gain weight, but I like to know about these things when/if needed. Glad they were a hit. Mmmm. I’m going to have to look into this for the picky kitties in my life. I’ve run us late in doing our Chewy reviews for this month, but we’ll have both of ours up next week, at the very last minute possible. Sending your our purrs and prayers. I bet they would like it.